The World Space Week 2017 poster will be designed by renowned space artist Pat Rawlings, it was announced today by World Space Week Association. 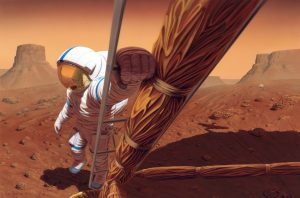 The artwork, showing a human stepping on Mars, was chosen to represent the 2017 theme “Exploring New Worlds in Space”. “We are thrilled to work again with Pat Rawlings, the brilliant space artist who has designed posters for several World Space Week since its inception in 2000,” said Dennis Stone, President of World Space Week Association. World Space Week, the largest space celebration on Earth, included 2,700 events in 86 countries last year. The United Nations-declared event is held annually from October 4 to October 10, according to the Association’s 2016 report. “Youngsters around the globe are excited about the idea of exploring new worlds in space. World Space Week 2017 will stimulate their interest in learning, so that they might become space explorers of tomorrow,” Stone said. The World Space Week Association Board of Directors selects a different poster each year which best portrays the annual theme of World Space Week. The poster is distributed each summer to participating nations and its image is widely seen during that week through the world, the Association said. “This year’s theme will focus on both human and robotic exploration of new worlds in space, including exciting plans of the government and private sectors,” Stone said. The Association encourages the space community to celebrate World Space Week 2017 and to add planned events to the calendar at www.worldspaceweek.org.